Mindful Uncertainty: What is Psychotherapy? … in terms of technique: He should simply listen, and not bother about whether he is keeping anything in mind. The thing I am trying to say is that for the cook the two experiences are different: the slavish one who complies gets nothing from the experience except an increase in the feeling of dependence on authority, while the original one feels more real, and surprises herself (or himself) by what turns up in the mind in the course of the act of cooking. When we are surprised at ourselves, we are being creative, and we find we can trust our own unexpected originality. We shall not mind if those who consume the sausages fail to notice the surprising thing that was in the cooking of them, or if they do not show gustatory appreciation. A person always acts under conditions of uncertainty. Professional education involves cultivating skill and knowledge.Psychologists are trained to recognize behavior patterns and to develop serviceable formulations in their attempts to be helpful.Clinical students want to both “know” and to “know how” but are often uncomfortable with their uncertainty.In time, most learn not to be. A good deal of clinical supervision involves supporting the trainee while he manages his discomfort with clinical work’s guaranteed uncertainty and ambiguity. It is understandable that many therapists-in-training yearn for technology, some precise set of tools that might give them the exactness and expertise they associate with professionalism. If only it were that simple. But people aren’t that simple. Although people make sense, we can’t expect them to be less complex then they are. Our defining quality is that we engage in deliberate action. We make choices. Since people’s pathologies create restrictions in the ability to engage in deliberate action, as people become less ill, they become less predictable. Understandable, but not more predictable. We diagnose illness, not health. Illness is simpler than health and can be categorized because it is more restricted. But even within the restrictions of pathology there is deliberate action and choice. The arena of play is only smaller. My job is to help students become experts in managing their uncertainty, in navigating ambiguity, in recognizing what is in flux with no necessary outcome. Circumstances are often precisely unclear. The problem is not only that the student is anxious about feeling uncertain, but that circumstances do not have a determined outcome. “What will be, will be” is not a belief I encourage. I do not accept the fatalism of destiny. I don’t want my students too, either. If therapy is to facilitate health, and if health involves an enhanced freedom to choose and create, then absolute prediction is antithetical to the practice. That’s a tough lesson when security is tied to certainty. Empathic action and the I-Thou relationship, vital to psychotherapy, require an embrace of the incomplete understanding we actually have of one another. Starting with uncertainty, psychotherapists discover who they are sitting with and act on that understanding in an ongoing improvisation. Each act is new. Mindfully ignorant, tolerant of uncertainty, therapists know they will play their part in a unique and unscripted play. They know they do not already know and are uncertain they will acquire the needed knowing. The empathic therapist is an expert at playing this uncertainty game. It requires faith and skill. It requires patience. My job is to be open to surprise, and to celebrate when surprise happens. You will surprise me. I am certain that you will show me something I don’t already know, something new to me. I expect it and am rarely disappointed. Being open to surprise is central to psychoanalytic practice.Freud required it of the analyst and it has been essential to real psychotherapy ever since. Transference, pre-judgment and stereotyping restricts surprise, coming as it does from a preformed schema or understanding. Having a treatment plan can be problematic if it also carries an insistent demand for compliance. (I want my guide to know her way about but not where I necessarily have to go). Reductionism and deterministic theory are rarely helpful with the intimacy held dear by the psychotherapist.At best, they provide a security blanket, soothing when they don’t cover up or obscure. Freud’s “free association” was developed as a method of liberation from the neurotic and culturally unexamined. He also insisted that our developing bodies must be considered, that “anatomy is destiny” and that “the child is the father of the man”.His theories unraveled the wefts and warps of development and sexuality. Freud wanted us mindful of our primate body, insisting that our animal nature is a condition essential to treatment and understanding. But conditions are reminders, not predictors. At least not in the causal sense of this condition necessitates that behavior. You may know that sexual tension is in the mix along with my moralistic judgment but that does not cause my behavior. I may have my reasons for doing something else. And I might change my mind and reorder my priorities just to vex you. You’ll have to see. Good clinical teaching takes us away from a rigid and limited scope of theory, even good theory, and brings us back again and again to observation and description.Good description invites freedom, especially as it invites re-description and the negotiation of the description’s accuracy and use. Not already having the answers, the skilled clinician knows she has to go out and look, and then look again. She knows she will have to share and negotiate what she thinks she sees for it to be helpful. So where to look? And how can we explore effectively and successfully? 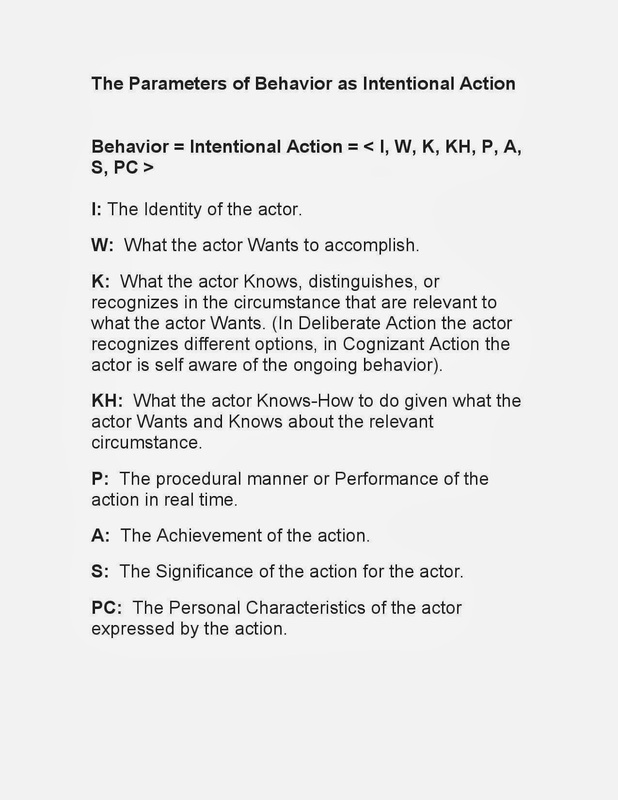 The Parameters of Intentional Action help identify what one needs to know in order to understand what someone is doing.These parameters also serve as a reminder of what we don’t know. Knowing that we don’t know is an essential aspect of empathy. It is good to remember to be careful of what we presume. Wrongly presuming may lead to empathic rupture and the hurtful recognition of being misunderstood. Part of the therapist’s job is to look carefully and share what is found with kindness and toleration. The improvisation of sharing facilitates accuracy and collaboration. To negotiate understanding is an act of respect. My friend and colleague Ray Bergner has pointed out that psychotherapy should be governed by policies rather than hard and fast rules. Policies guide rather than restrict and are applied as a default position unless there is reason enough not to. As a psychoanalyst, I try to be guided by an attitude, the analytic attitude, a set of policies that Roy Schafer distilled from Freud’s papers on technique. I have modified Schafer’s policies given my concerns (and with some reminders from Ray Bergner, 2013). 1. Regard and treat the client as an agent. 2. Regard and treat the client as a person who is to be given the benefit of the doubt. 3. Engage the client as an ally and collaborator.Be on the client’s side. 4. Act with respect and appreciation of the client’s ordeal and possibilities. 6. Attempt to be helpful without zeal. 8. Cultivate nondirective “free association” by inviting non-coerced honesty. 9. Attempt empathic neutrality, confrontation and interpretation over direct suggestion. 10. Avoid rigid “black/white, either/or” thinking and when appropriate confront it. Invite the acceptance of a multiplicity of useful meanings along with inherent ambiguity and uncertainty. 11. Maintain focus on the subjective state of the client and of the client’s understanding of their circumstances. Go only as fast as the client can manage. 12. When appropriate, interpret transference and resistance, mindful of ambiguity and uncertainty. 13. Maintain a zone of safety and toleration. Policies are to be followed until there is sufficient reason to do something else. This is a matter of clinical judgment. This requires experience in navigating uncertainty. s originally published @ Freedom, Liberation and Reaction: Lessons in Psychology and has been syndicated with permission.